High school was years ago, and Kendell is ready to admit that Tyler, her best friend’s younger brother, has matured into a good-looking man. But the once-popular Kendell is recovering from a marriage-gone-wrong, and she regrets turning Tyler down for high school prom. On their road trip to deliver a refurbished camper, Kendell rediscovers all the reasons she liked Tyler, but it might be too late to rekindle their friendship. Kelsey is living out her dream for the weekend as she participates in a reality show contest by living on a 19th century film set. The contestant who wins the show receives a trip to England and $100k, more than enough to get her through grad school. When she meets Devon, who was coerced by his sister to participate, friendship blossoms. When things go wrong for Kelsey, Devon is there to help, and she soon realizes that winning the contest isn’t what she most desires. When Jacqueline's boyfriend Colin drops out of their long-planned road trip with friends to put his job first—again—it's the final nail in the coffin of their dying relationship. But then Hudson, her best friend’s brother, takes Colin's spot for the road trip, and Jacqueline’s disappointment in her ex takes a back seat to the chance for reestablishing the close ties she once had with Hudson. When their friendship detours into romance, it forces Jacqueline to question her reasons for breaking up with Colin and her future with Hudson. Tristan is proud to be an entrepreneur, running a popular singles’ lifestyle blog. So when she gets an offer to cover a singles convention in Las Vegas, she needs to find a way to get there from another freelance job in Salt Lake without breaking into her personal savings. Her friend sets her up with a co-worker who happens to be driving that way, and Tristan is more than surprised to come face-to-face with a man she has a lot in common with, not to mention seems to click with right away. The two decide to play a prank on Tristan’s friend, and pretend that they are smitten with each other, but soon, the lines between pretend and reality start to fade. Dayna reluctantly takes time out of her busy work life to drive her mother up the Pacific Coast Highway from California to her brother’s home in Oregon. Strangely enough, they keep running into two brothers who are traveling the same route in honor of their sister’s memory. The older brother Garrett is a merciless flirt, but the younger brother Roman is who captures Dayna’s attention. Soon she realizes that the brothers are extremely competitive, and she’s just become their next target. Sarah’s secret crush on Justin takes a sudden turn when he breaks up with his girlfriend and declares that he’s interested in Sarah. She believes he’s just on the rebound, and they slowly drift apart. Six months later, Sarah still can’t stop thinking about what might have been. She ropes her friend into taking a road trip to visit Justin, hoping for a second chance. When Justin sees her, he wants answers, and Sarah has to decide if she’s brave enough to finally tell him the truth. I love that the stories in this collection are so very different from each other, even with the same theme! 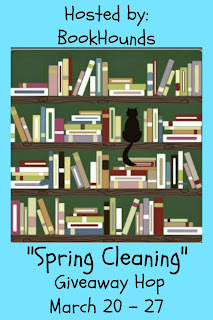 The premises are creative, the details are fun, and the romance is sweet as always. 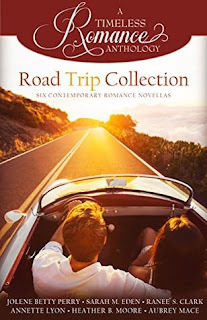 I love taking road trips, especially with my husband since he prefers driving and I can read my books :) These stories capture the feeling of adventure and escape that hitting the road has in store. The most light-hearted of the bunch and my personal favorite is 'Head Over Heels" with the classic road trip element of singing 80's ballads at the top of your lungs, a Tom Hiddleston look-alike, and the out-of-nowhere romance that ensues (what a fun first kiss!). The other novellas offer a bit more relationship drama/angst, and Sarah Eden's regency reality show takes the term road trip to a whole new level with horse drawn carriages. Highly recommend- a great summer read! The road to true love never did run smooth, but a few bumps along the way make it all the more thrilling. This timeless truth is showcased in Three Little Words, a charming compilation of short stories written by a trio of popular LDS romance novelists. 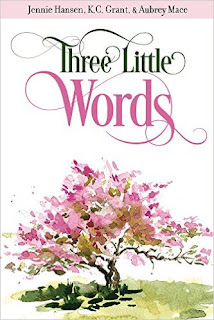 Readers are invited to follow the journeys of three young women as they encounter love where they least expect it. For as long as she can remember, Bailey has loved the boy next door. But despite her feelings, his schedule and his little brother keep getting in the way. Will her childhood crush finally blossom into something real, or will she discover that true love is waiting just around the corner? The bet is simple: Elizabeth, a speech therapist, has three days to teach a country bumpkin with a drawl as thick as molasses how to speak like a gentleman. But as she gets to know her charming student, it soon becomes clear that there may be more to him than meets the ear. Cassidy is in love with the idea of love, though after her most recent breakup, the possibility of finding Mr. Right seems hopeless. But when she meets a handsome classmate in her painting class, she may end up learning more about chemistry than about art. Cassandra is in love with the idea of love, though after her most recent breakup, the possibility of finding Mr. Right seems hopeless. But when she meets a handsome classmate in her painting class, she may end up learning more about chemistry than about art.